Fr. Sean Connor , who has led St. Ann parish in Neponset since 2008, will leave his role as pastor later this summer to take on new duties at Sacred Heart parish in Weymouth. Fr. Connor, 46, explained the news to parishioners at Sunday Masses and in a letter distributed to the St. Ann community. Connor is a Marshfield native who also serves, along with his fellow Dorchester pastor Fr. 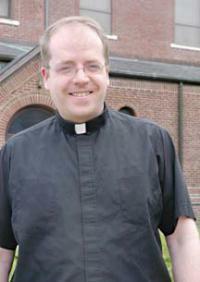 John Connolly, as a chaplain for the Boston Police Department. Connor has been credited for building a stronger parish at St. Ann— particularly boosting attendance among young families— who flock to Connor’s children’s Mass on Sundays. The Archdiocese of Boston has not yet indicated who will replace Fr. Connor. The church is currently transitioning into a cluster system in which Catholic parishes will be bundled into “pastoral collaboratives” that will be phased in over a number of years. Under that plan, St. Ann and St. Brendan parishes would be teamed into one cluster. "Fr. Sean Connor has been a superb pastor for St. Ann Parish," said Terry Donilon, a spokesman for Cardinal O'Malley. "He has brought a passionate commitment to evangelization, serving the parish and school community and being a strong presence in the neighborhood. He has graciously accepted the Cardinal's request to take on this new assignment for the good of the wider Church. We are committed to providing for the pastoral care of St. Ann Parish."